Providers responding to a recent survey on ICD-10 readiness expressed concerns about the impact the coding switch–set to go into effect Oct. 1, 2015, after being delayed in April–will have on revenue, productivity and workflow. Of 349 providers surveyed between May and June by the American Health Information Management Association and the eHealth Initiative, 38 percent said they think revenue will decrease in the year immediately following the transition; only 6 percent said they think revenue will increase. Forty percent of respondents, however, said they would be ready to go through with end-to-end testing by the end of this year; 25 percent indicated they would be ready by the end of 2015. The surprise is that 40% have indicated readiness or will be by end of year for end to end testing. End to end testing includes all aspects of ICD-10 including payers and other outside entities that may be recipients of the data. While the mechanism for handling the ICD-10 codes may work correctly, the handling of the codes by the payer is giving the greatest angst to providers. Some specialties are more adversely affected by the transition because of the small percentage of cross-over codes. Specialties like orthopedics that have always had to add modifiers to indicate specificity of side now have a different code for left or right. The primary impact is that ICD-9 has been around and used for such a long time that the use of codes and modifiers is almost like breathing. It may take these practices some time to develop new habits and mistakes will be made. Instantly you can see the impact on workflow, productivity and revenue. Slower workflow because check marks on super bills and circling modifiers will no longer be used. But it’s even more than simply replacing a superbill with something. It’s provider specificity of documentation as well. New habits and workflow must be considered. Do you use coders in your practice? The smart thing to do is to have them coding in both ICD-9 and ICD-10 months before October 15, 2015. ICD-9 does not go away for worker compensation carriers and so a double system must be maintained. What kind of issues do you think that might cause? There is talk of a greater reliance on outsourcing of coding because of the cost of training and reliability of coders who are experts in ICD-10 coding. This is especially true of specialties that already have complex coding and rely on coders for their primary revenue stream. Think productivity. Think revenue. 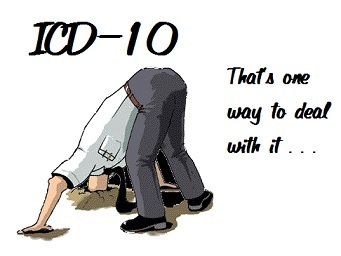 It may well be that ICD-10 will transition smoothly like 1999 rolled over to 2000, but somehow this writer doubts it. 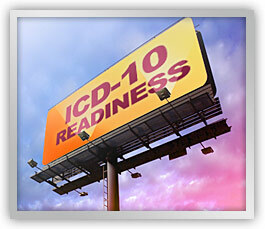 Get into ICD-10 mode now. Stop worrying about it and instead, thoroughly think through the implications.